U.S. Secretary of State Hillary Clinton started the first leg of her African tour Wednesday with a message of support for Africa’s developing economies. “We believe in Africa’s promise. We are committed to Africa’s future and we will be partners with Africa’s people,” Clinton said at the African Growth and Opportunity Act conference in Kenya. The conference was born out of U.S. efforts to create access for African business people into American markets. During her speech, in front of representatives of more than 35 African nations, Clinton talked about economic initiatives that are working in Africa. She also said African countries can focus on good governance and women’s rights as ways to build economic growth. “The social, political and economic marginalization of women across Africa has left a void in this continent that undermines progress and prosperity every day,” she said. “Yet we know across Africa women are doing the work of a whole continent.” Clinton was expected to meet Kenyan leaders after the speech. U.S. statements about Kenya’s handling of its presidential election have brought criticism from its leadership in the past. Days before her arrival, Kenyan Prime Minister Raila Odinga was quoted in the local media as saying that Kenya does not need any more lectures on its governance and needs more advice on how to build trade with the rest of the world. 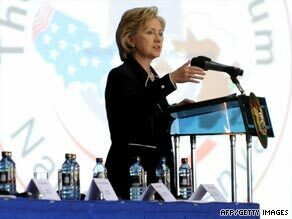 Clinton also suggested African nations can increase trade opportunities by trading more within Africa. “The nations of Africa trade the least with each other than any region of the world,” Clinton said. “The biggest single opportunity you have right now is to open up trade with each other.” Clinton’s trip comes just three weeks after President Barack Obama’s trip to Accra, Ghana, and Clinton highlighted many of the themes he struck. The State Department said Clinton’s visit is the earliest trip by a secretary of state and a president to Africa of any previous U.S. administration. In an administration that prides itself on a plethora of “priorities,” officials say they are putting Africa toward the top of the list. After Kenya, Clinton is expected to include South Africa, Nigeria and Liberia among her stops.